After four red weeks in a row the Dow and SPX closed up 1 %, the Nasdaq even 2 %. Every rally since March has begun with some strong updays. But what we saw last week weren't motive waves to the upside, it was some corrective crap. Thus, I don't think an A-B-C completed at 1045 is likely. Last weekend I wrote that a test of 1080 is likely. On Tuesday, 1080 was tested for the first time and I thought that wave [ii] might have ended. The market sold off afterwards but the bulls stepped in and tried to break 1080 for the second time on Thursday. 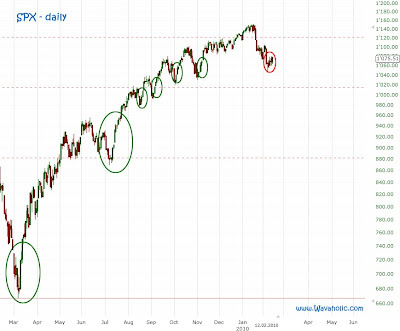 They failed miserably and may try it again tomorrow to make a triple top like we got one at 1150. 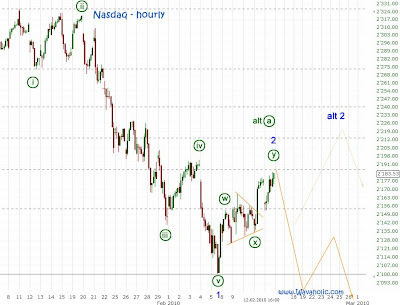 With Friday's action I had to change my simple zigzag count to a double zigzag count. 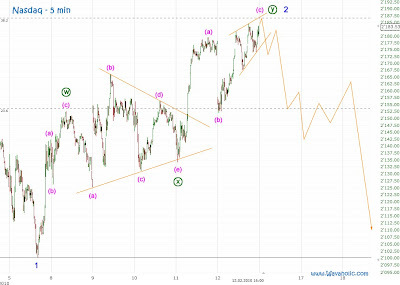 The market is in wave c of (y) which is likely to finish tomorrow around 1080. 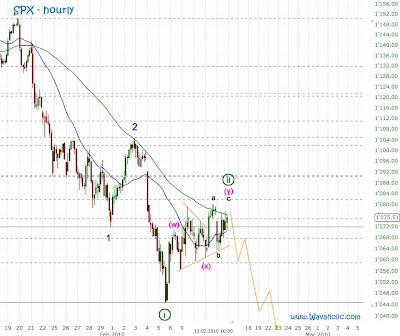 A decline below the low of wave (x) will be a first sign that wave [ii] has finished. A break of 1045 confirms it. The Dollar is still somewhere in Minor wave 3 and should rally a few percents more until this wave will finish.